You can clean slate tile even if stains have soaked in, but you have to be careful to use the right cleaning method. If the tiles are sealed correctly, stains stay on the surface and are easy to wipe off. 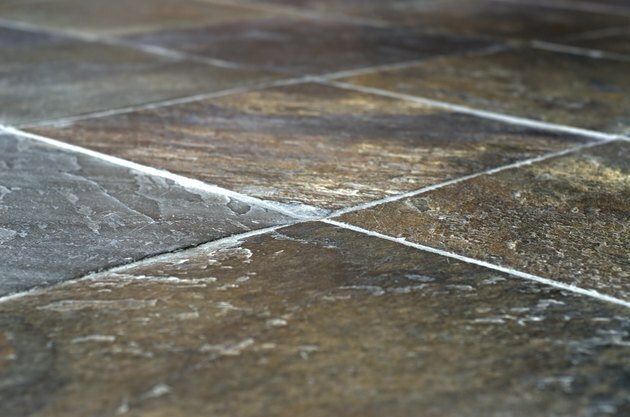 If the sealer is old or did not form a complete seal, stains may soak into the tile and grout because both are porous. In that case you need strong cleaners, but you have to be careful not to use chemicals that might damage the tiles. Once the tiles are clean, applying new sealer preserves the tiles and grout and repels stains. Porous slate tile may stain if not sealed. Seal slate tiles in accordance with the sealer manufacturer's instructions. Vacuum frequently because grit is harmful to the tiles' sealer and can scratch the surface of the tiles. Wipe regularly with a wet mop using a bucket filled with warm water and household cleaner. Scrub lightly in areas where there is a build-up of dirt or a stain, being careful not to damage the sealed surface. Rinse the slate floor with a clean mop and clean warm water to remove any leftover soap or dirty water. Dry the floor with a dry mop or cloth. Pre-wet the slate floor thoroughly with a mop and a bucket of warm water. Wipe all areas of the tile and grout with the wet mop, but don't let excess water sit on the surface of the tiles. Apply the stone cleaner to a small area of tile in an unobtrusive location and scrub the slate and grout thoroughly. Check the result for unwanted discoloration and any damage to the tile or grout. Proceed with the cleaning if the result is acceptable or change cleaners if you see a problem. Apply the stone cleaner to the rest of the floor following the manufacturer's instructions.Treat the whole floor because the cleaning may change the overall look and is required for applying new sealer. Scrub with the brush or rotary brush tool to remove dirt and loose stone sealer. Wash off the stone cleaner with a mop and a bucket of warm water. Use the wet vac to remove the dirty water. Rinse the slate floor with a clean mop and clean warm water. Use the wet vac to remove the clean water. Dry the tiles with a dry mop or cloth. Apply new stone sealer according to the manufacturer's instructions.